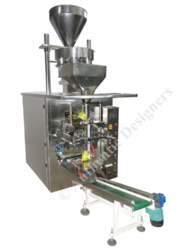 Leading Manufacturer and Exporter from Noida, our product range includes Automatic Form Fill And Seal Machines such as Automatic Form Fill Seal Machine with Multi Head Weigh, Automatic Form Fill Seal Machine (Collar Type) with Electron, Automatic Form Fill Seal Machine (Collar Type) with Auger, Automatic Form Fill Seal Machine (Collar Type) with Volumetric, Automatic Form Fill Seal Machine (Collar Type) with Liquid, Automatic Form Fill Seal Machine (Pneumatic Type) With Cup and many more items. Power 3.5 Kw 220 V, 50 Hz. As per the necessities of the clientele, we are involved in offering the best quality range of Automatic Granule Packing Machine. Sugar, Pluses, Rice, Tea, Seeds, Wheat, Chips, Kurkure, Peanut, Dry fruits, candy and all granules etc. The perfect combination of high speed & high accuracy. The opening and closing speed of Weigher happens can be adjusted to be avoiding material Falling into pieces or being blocked. 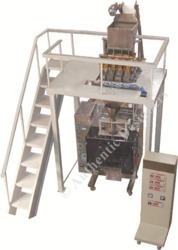 We have the wide experience in manufacturing the various type of Automatic Chemical Powder Packing Machine. Application Spice Powder, Detergent Powder Coffee Powder , washing Powder ect. Quantity / Capacity 20 - 40 & 90 Gram. 'V' Groove Type Sealing with Perfect Integrity. Speed 25 - 30 pouches per min. Power 1.5 Kw, Single phase. Motor 2 Motor Crompton Graves. 1.5 H.P for Auger & 0.5 H.P Main Motor. Air Consumption 2 - 3 CFM Compressor at 6 bars Pressure. Specifications This machine is used for packing of granular, powder and free-flowing products such as Dry Fruits, Beads, Sugar etc. Pulses, Rice, Sugar, Chana, Beans, Seeds, Soybeans, Coffee, Tea, Seeds etc. 'V' Groove type pouch sealing. Speed 6 - 8 packs per min. Power - 4.5 Kw Three Phase 410 Volt. All contact parts are of Stainless Steel 304. All around stainless steel covering . Speed 25-30 pouch per min. Spice Powder, Detergent Powder, Ayurvedic Powder, Welcome Powder, Herbal powder, Mehndi Powder, all powder product etc. "V" groove type sealing with perfect integrity. All around covering stainless steal 304. 2 motor Crompton Graves 1.5 Hp for auger & 0.5 Hp Main Motor. Heater Load 150 W x 2Nos.,300W x 2Nos. Speed 20 pouches per min. 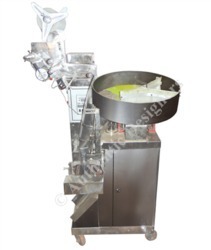 We are instrumental in manufacturing and supplying a supreme quality range of Automatic Tablet Pouch Packing Machine. Tablets (Press type), Naphthalene balls etc. All Contact Part Stainless Steel Covering. Motor: Crompton Greaves / Automotive. 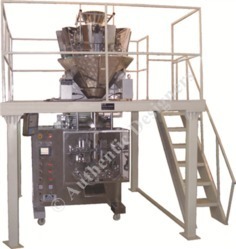 All granular products such as Sugar coffee tea namkeen snacks dry fruits nuts rice seeds cereals corn flakes cashew nuts pulses candy spices milk powder detergent powder pesticides etc can be easily packed with this machine. 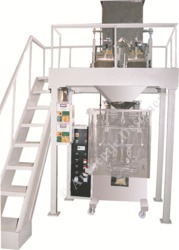 Filling System: 1 or 2 Head Linear Weigher. Speed 5-6 or 12-14 packs per min. Air Consumption: Dry air 4 - 5 CFM at 6-bar pressure. 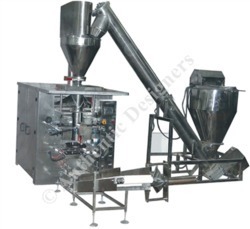 This machine used for Dalia Packing, Sugar packing, Coffee packing, Tea packing etc. 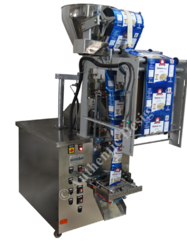 other all product packing machine. 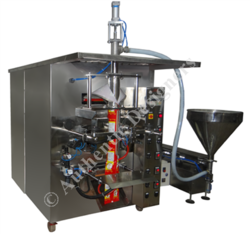 Under the precious guidance of our skilled professionals, we are offering a distinguished assortment of Automatic Chips Packing Machine. ‘V’ Groove type pouch sealing. Compressed air required 4- 5CFM at 8-bar pressure.